If a developer released a racing game in this day and age with only one track, we’d either expect the rest to be available as free DLC or consider them to have a screw loose. Back in 1995 though this happened. After wowing gamers in the arcade, Namco’s Ridge Racer was to become the PSone’s poster boy – a system seller that was able to show what the console could handle. 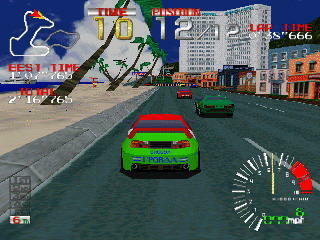 Compared to Sega’s rushed out Saturn conversion of Daytona USA it was enough to establish the PSone as the superior system right off the starting grid. It may have only had one track, but it was an incredible piece of design work. “A great start, now go for the lead!” the narrator would yell as you pulled away and headed down the straight. Progressing from 12th to 1st place wasn’t easy – the AI would quickly pull away from the starting line, leaving you for dust. You had to get to grips with the slightly erratic drifting too, which entailed learning how to regain control of your vehicle if it started to skid. After the opening straight – which featured a huge TV screen displaying Galaxian – came a tunnel with a bend, which then lead out to a narrow bridge and the first of a few hairpin bends. Approach the beach straight with enough speed and you could ‘catch some air’ before hitting the ground with a satisfying thud. The next bend had raised corners – it was possible to swing your vehicle along these while drifting in order to get round around it with ease. Next came another straight, complete with a low-flying helicopter and billboards for two other Namco games – CyberSled and Starblade Alpha. The gentle twists and turns of the track’s final part – set in a more industrial-style distinct – weren’t quite as exciting as the first part of the track but gave plenty of chances to overtake, as did the final home stretch. 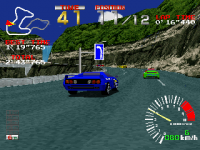 When Sega fans would claim that Daytona USA offered three tracks compared to Ridge Racer’s one, PlayStation owners would argue that Ridge Racer does actually have two tracks – you can race the original track backwards. Again, it’s testament to Namco’s design that when playing the track backwards it did feel rather different – downhill sections became uphill slogs, and vice versa. You could also extend the original course with an extra piece of track. Speaking of tracks of another sort, a lot of gamers hold the ‘90s rave music in high regard. Am I about to admit that I would put the disk into my CD player and listen to it on my stereo? Yes. Yes I am. You could also use your own music CDs – once the game had loaded, the disk was no longer required to be inside the console. 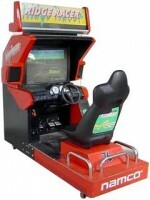 Namco included a few challenges to stop gamers getting bored too quickly – finishing in front of the black car was the final challenge and known for being notoriously tough. There were a couple of hidden things to discover too, like the ability to twist the flag around on the title screen. When loading up the game arcade classic Galaxian would also appear – if you managed to shoot all the invaders within in the tight time-limit then an extra car would become available. It’s very odd to think that for many early adopters of the PlayStation the first thing they would have played was Galaxian, isn’t it?